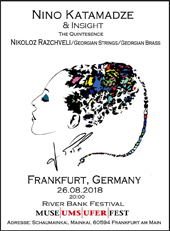 Georgia was presented with the status of a Host country on August 24-26 at Frankfurt River Bank Festival. The River Bank Festival is one of the components of the Frankfurt Book Fair, where Georgia was represented as the guest of honor. During the August 24-26, the diverse program was presented to the River Bank Festival visitors, among them concerts, theatre staging, flash mobs, activities for children, Georgian food and wine, etc. The project is supported by the Ministry of Education, Science, Culture and Sport of Georgia and organized by the National Music Center of Georgia. Concerts are scheduled for three days. Famous Georgian musicians and artists will take part in the program. The participant list features Iriao, Kordz, Zagareli and Strings, Movement Theatre, DJ Luka Nakashidze and Misho Urushadze, Nino Katamadze and Insight, Nikoloz Rachveli & String and Braze of the National Symphony Orchestra; Children's Ensemble "Little Georgica", etc. Iriao, also known as Ethno-Jazz Band Iriao, are Georgian jazz and folk group, led by David Malazonia. The band is known for their unique style due to the combination of traditional Georgian polyphonic singing and jazz. Alexandre Kordzaia, electronic music producer, performer, and composer (aka Kordz), was born in Tbilisi. In 2016 he completed the degree of Audiodesign at the Music Academy of Basel in Switzerland, where he studied the composition of Electroacoustic music as well as the Art of recording and sound engineering. Later on, Kordz was invited by Georgian conductor Nikoloz Rachveli and the Viola player Giorgi Zagareli to arrange his electronic compositions for the Georgian Philharmonic Orchestra. Movement Theatre was founded in 2001 by Kakha Bakuradze founded and represents the synthesis of drama, pantomime, motion, sights, opera, folklore, circus, illusion and contemporary music.